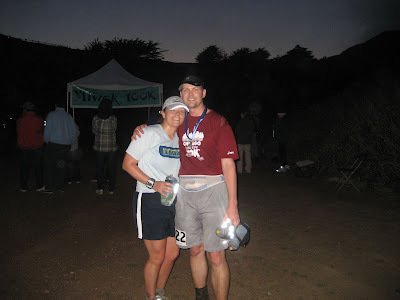 I had the amazing experience of crewing and pacing Brian at the Miwok 100k trail race last Saturday. Earlier this spring we decided after Brian registered for the race that we would make a vacation out of it, so we decided to arrive in the San Francisco area the Tuesday prior and spend time being a tourist. 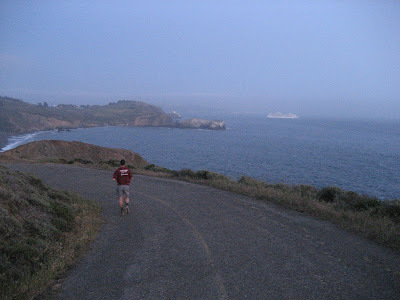 We were able to tour the Miwok course aid stations and also go on a training run from Tennessee Valley to Muir Beach. Doing this really helped me know where I would be going as crew on race day. The alarm went off on Saturday morning at 3:30am and we both got up and started to get ready. We left our hotel in Mill Valley as planned at 4:15am. 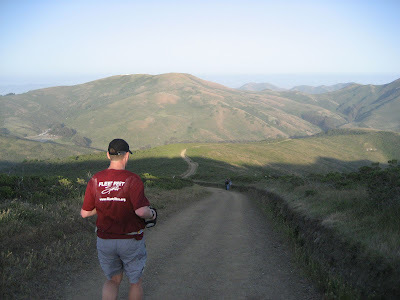 Once we parked at race start at Rodeo Beach, Brian checked in with race officials and chatted with Tom Riley, a runner he paced last year at the Kettle Morraine 100 mile, and other fellow runners. I got our finish line drop bags ready and dropped them on the appropriate tarp. Pretty soon the race director announced that we would be walking over to the start line on the beach. Brian was excited, mixed with a little nervousness, as we approached the beach. I felt the same, and I could really sense the energy coming from all of the participants. The race actually started about 15 minutes late because of the delay with carpooling people in from a lot over a mile away to help with the issue of severely limited parking at Rodeo Beach. 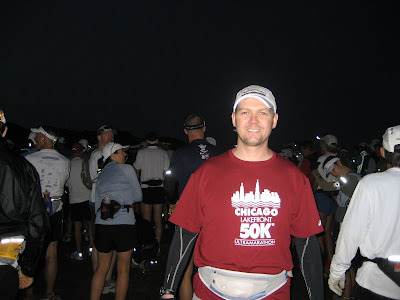 At about 5:55am, the race began and off went the 300+ runners to begin their 62.4 mile trek. I saw them snake their way up the hill, single file. After a few minutes, I returned back to my car and made my way to the Tennessee Valley aid station, which is about 11.9 miles into the race. On the way I stopped at a gas station to top off the tank (paranoia about running out of gas still lingered from the previous day’s scare) and to get some coffee and hopefully some sort of breakfast item. Unfortunately there weren’t many options, so I ended up getting some animal crackers and goldfish crackers that would end up being my only crew food for the day…something I will have to plan a little better for next time! 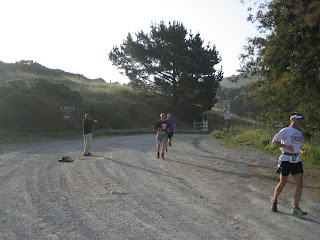 I got to Tennessee Valley, parked, and was able to snap a couple pictures of the lead runners while getting Brian’s two bottles (water and Gatorade) and other items together. I updated Brian’s pace chart he created in Excel with the new 5:55am start time (instead of 5:40am, when it was supposed to start) so that I could get accurate time ranges of when he would be coming in. His goal finish time for this race was 14 hours, which is the cutoff qualifying time for the Western States 100 lottery. Knowing that he usually goes out a bit fast, I made sure I was in position for taking pictures and getting him his supplies. Sure enough, I see Brian run down the hill coming into the aid station at 7:58am, which is actually not in his pace chart range of 12-15 hours. It’s a 10:45 (h:m) protected finish time. Woah! Brian tells me he feels good. We exchange bottles, I give him a GU, ask him if he took his S!Caps, tell him he’s going at a very fast 10:45 pace, tell him good luck and that I’ll see him at Muir Beach. Then I got back to my car and drive straight to Muir Beach, which is only 4 miles from Tennessee Valley, so I have to hurry up, get there, park, and ready to do another bottle swap. It took about 10-15 minutes to get to Muir Beach. I parked in the beach parking lot and walked back to where the aid station was located, near the entrance to the beach park area. I stand along the trail and cheer runners on as they go past, still fresh-looking and in good spirits 16 miles into the race. Brian approaches at about 8:53am, 3 hours into the race. He is still “off the charts” with an overall protected time of a little over 11:30. He looks great. 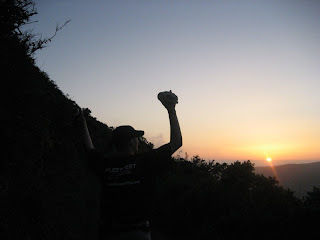 I hand him his stuff, tell him his pace and that it’s 5.7 miles to the next aid station (Pan Toll). I walk with him a little bit as he takes his GU. After a few minutes I wish him well and run back to my car, fill the exchanged bottles, and make my way to Pan Toll, which is a longer trek up Muir Woods Road, then onto Panoramic Hwy. I pulled into the Pan Toll full-looking parking lot, hoping to get a parking spot quickly. Luckily I was able to get one without waiting. Phew! I went over to the ranger station to pay my $6 fee and then got organized for Brian’s arrival. At around 10:13am Brian came down from the Old Mine Trail into the Pan Toll aid station (21.7 miles) parking lot looking a little tired. Miles 20-24 always seem to be rough for him, and the fact that the miles from Muir Beach to Pan Toll were mostly uphill didn’t help matters. He took a little bit longer here, and I got him some food and GU for him to take for more energy. I told him that he was now at a 12:30 projected finish time, slowing but still ahead of schedule. I walk with him through the parking lot and wish him well on his way up to Bolinas Ridge, the next aid station, in 6.7 miles. I get back to my car and drive up to Bolinas Ridge, another 15 minute drive on twisty roads, through the beautiful redwoods. There are a lot of cyclists on this stretch. 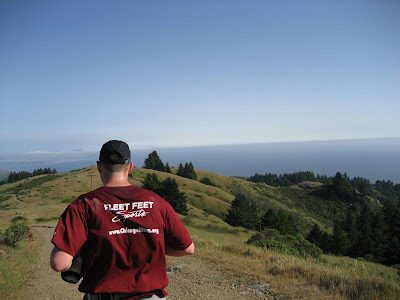 I also see runners that are running on the Coastal Trail on their way to Bolinas. I knew that parking would be a challenge at Bolinas, as there is a parking lot that fits only about four cars and then cars are parked along the road. Seeing the parking lot, which is pretty deep, I asked a volunteer if I could just park behind one of the cars here. He said I could pull behind his, which was one of the four cars. Since his wasn’t parked as far back as the one next to it, I decided to just pull behind that one, figuring that the car probably belonged to a volunteer who would be sticking around for a while. 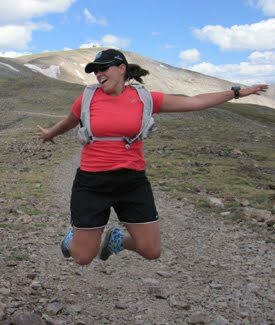 It was a great spot because I could see runners coming into the aid station and cheer them on while sitting in my car. A short time later I got Brian’s stuff together and stood on the other side of the trail from where the car was parked to get a better view from the top of the hill of runners coming down. At about 11:50am, I saw him at the top of the hill and was able to get a video of him running down. He still looked great after running 28.4 miles and seemed to have gotten out of the slump he was in approaching Pan Toll. I told him he was on a 13:00 pace now, still ahead of schedule. I walked with him a bit down the trail past the aid station and told him to be careful of the big downhill to the Randall Trail aid station. After we parted ways and I returned back to the aid station. I figured I had about 3 hours to kill before I saw him again at this same aid station, so I decided to go back towards Pan Toll (no restroom facilities at Bolinas Ridge) for a little while. There was a parking lot/restroom in between at Rock Spring, so I decided to park there and get myself ready for pacing duties that would begin in Pan Toll a little later on. Since I wouldn’t have much time after I saw him again at Bolinas Ridge to get to Pan Toll, find parking, and get ready, now was my chance. I taped my foot where I had reopened a blister during our training run two days prior and got my bottle filled and what I wanted to take with me on the run ready to go. It seemed a little crazy to be getting prepared 2+ hours in advance, but I figured it would be good to do it and get it out of the way so that I can cheer runners in back at Bolinas. 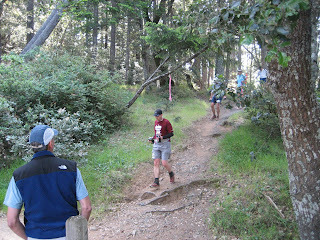 I made my way back up to Bolinas Ridge and parked my car in the same spot, and cheered for the runners coming in. Lots of curious cyclists asked what event was going on, most were amazed at the distance these runners were travelling. One of the race course marshals controlling traffic would tell runners on their way back to Pan Toll that the uphill ahead was actually an optical illusion. That got a few chuckles out of the tired but still high-spirited runners. I was truly amazed at how well people were doing after nearly 43 miles of running. It definitely takes a special type of person after so many miles to show a big smile and have the energy to thank volunteers for being out here. 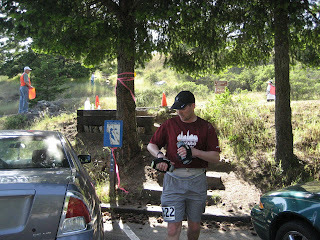 After a while I decided to get out of the car and stand near the aid station to await Brian’s arrival. I saw a few runners taking a break here, one of whom was debating on whether or not to continue. 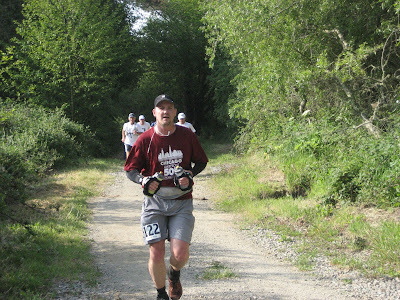 I think I had heard him mention that he had pulled his groin and was going to try to walk to Pan Toll and would decide there on whether he should continue (shortly after leaving the aid station, he came back and made the smart decision to DNF). I also was watching in amusement some of the kids who were water/GU2O volunteers. It’s funny what kids will do to pass the time during this time of event. :-) One of the girls was saying “only 20 miles to go” which got a few sarcastic smiles from the runners. ONLY 20 miles to go! 8-) She later switched her comment to “you’ve gone 43 miles, yay!” which I’m not sure is any better! At about 3:06pm I see Brian approaching the aid station. He looks a little tired and mentions that he’s got bad blisters which have been bothering him for a while. He debated on whether or not to tend to them but then decided against it, not knowing if it would help matters at this point. He found a tree stump to sit on and I got him a couple cups of Coke and some salty snacks from the table, and then I reapplied sunscreen (looked like his neck was getting a bit of sun). He gave me his phone so that I could charge it in the car before we both head out at Pan Toll. At this point he was at a 13:30 projected finish time, still ahead of schedule. I urge him off the stump and out of the aid station and walk with him until we get to where my car is parked. I told him that I looked forward to pacing him at Pan Toll soon. I got in my car and I drove down to Pan Toll, hoping that I would be as lucky as before and get a parking spot. Unfortunately when I pulled into the lot, there was a pickup truck already waiting for an open spot. He decides to park in a 15 minute parking spot, and then I see a car coming from the opposite direction (presumably from a parking spot). Sure enough, I drove around the one-way parking lot and pulled in to an open spot. Phew! I lucked out again. Now it was time to get prepared to start pacing. I went to the aid station and grabbed a GU for Brian, then walked around the parking lot a bit, stretched, and then stood ahead of the aid station to cheer on the runners and wait for Brian. My pacing stuff was ready to go, including Brian’s headlamp and my flashlight (just in case). Familiar runners started to pass by so I knew that Brian would be coming through shortly. Finally, I see him start to come down the stairs at about 4:55pm, which is now slightly faster than his goal time of 14 hours. I mention this to him when he approaches and he responds, “Dang! We’d better get moving then!” We stopped at the aid station to get some more Coke for him and I grabbed some salty potato chips to stuff in my mouth to stave off hunger I was starting to feel. Off we went – it was nice to start moving after sitting or standing for most of the day. The trail from Pan Toll to Highway 1 is mostly downhill, which I welcomed even though it caused a little bit of shin tightness at first. Sometimes I ran ahead so that I could take “front pictures” of Brian. So many times when we run together I take pictures of his back, so I wanted to balance it out a bit. :-) It was also good to run ahead, especially to make sure we were still going the right direction, since it seemed that this segment of the course had less pink ribbons marking the course. 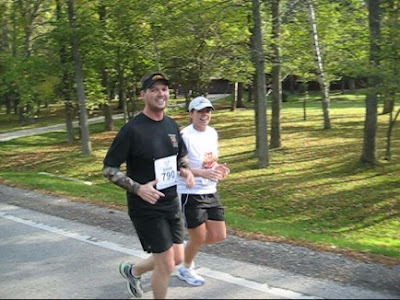 I encouraged Brian and noted that he was past his longest distance run of 50 miles. I could tell he was a in a bit of pain with the constant downhill – it’s ironic when the flat and uphill parts are welcomed since they hurt less to get through. 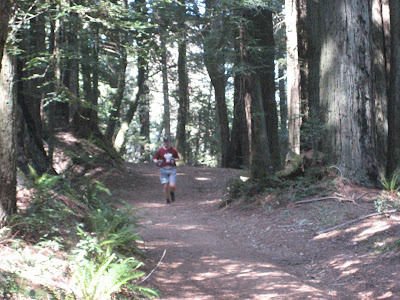 Once we were out of the woods, we crossed Muir Woods Road and we started an uphill portion of the race up to Highway 1. We were approaching the point at which the RD had noted that every year some people make a wrong turn but we knew it was coming after studying and tracing the maps prior to the race. A guy up ahead called back to us and asked if we were still in the right direction and we said yeah, it shouldn’t be too long before the hard left from this Redwood Creek Trail to the Miwok Trail. This part is pretty narrow as we brush past tall wildflowers and other plants, maybe some poison oak, but apparently I am not allergic. We walked most of this part as it was consisted of many uphill switchbacks. As we got to the more open area of the trail I made sure to look around me and take in the beautiful views. I was really glad to be out here, with Brian, on this beautiful trail. We arrived at the Highway 1 aid station and I checked the time against Brian’s pace chart and told him he was now at about a 14.25 hour finish time now. I saw a quick look of disappointment which very quickly switched to a smile and he says, “that’s ok, I’m going to have fun the rest of this race.” I got him some Coke and when I turned around to give it to him he was sitting in a lawn chair. I smile, and say “What the heck are you doing sitting down? !” and shake my head. He asked me for a slice of pizza (yum!) and then I took a little video of him as he gave his feet a little break and had a few bites of pizza. 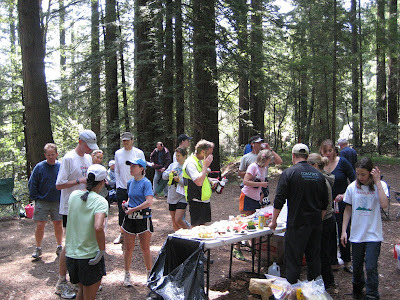 He handed me the rest his slice which I gladly accepted, and then we thanked the volunteers on our way out of the aid station. It was time for more uphill on the Miwok Trail. Brian knew that the downhill to Tennessee Valley would be coming soon enough. I knew from our training run the prior Thursday that this portion was pretty punishing. We continued to chug along, running occasionally when we could. We reached Coyote Ridge Trail and went up some more before going down, down, down the trail, then onto the Fox Trail. Brian is wincing every so often during this point, but trying to keep running to take advantage of the downhill as much as possible. I continued to run ahead at times to take pictures and videos. We finally made it to the bottom of the hill, onto the pavement leading to the aid station. Just before the aid station, Brian pointed out this woman who had been cheering at different points on the course. When we approached her, he asked her name, which was Susie, and he thanked her for cheering him on during the race. Now we were at the aid station, quickly got our bottles filled, and then headed up the trail past the stables for uphill segment on the Old Springs Trail. Only four miles to go! For me, the miles had gone by really fast. I was constantly in awe of our surroundings as well as Brian’s perseverance. The sun was starting to set as we continued on the trail. Brian was in great spirits knowing that we were almost there. A spectator mentioned we had only a couple of miles to go. We made it up the last hill, turned onto the paved trail and started the long downhill to the finish. It was the home stretch! Brian actually welcomed the pavement as it seemed to be less painful to run on. I continued to run ahead to take pictures, and was able to look around at the views more because I could pay less attention to where my feet were landing. We could see the finish down below, definitely a welcome sight for Brian after over 14 hours and over 62 miles. It was now twilight and the sky getting a little darker, but we luckily never needed the headlamp and flashlight I had carried with me attached to my water bottle. We made it to the bottom of the hill and while I tried to keep a steady hand with the camera to take video, Brian kicked it in and crossed the finish line in 14:27:33. Awesome! I was so happy for him. I caught up to him after the finish line and gave him a congratulatory hug and kiss, and then asked guy nearby to take our picture. What a great finish on a great day! Brian found Tom, who was waiting for his friends to finish, and they chatted while I retrieved our drop bags so that we could put on some warm clothes. By now it was getting pretty dark and chilly. We then went over to the tent to get some post-race food and Brian’s race goodie bag. 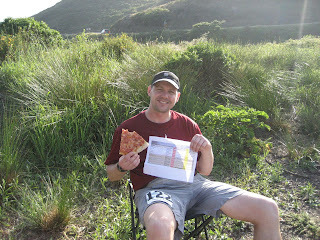 Luckily it was warm in the tent near the portable heater so we sat there while we ate and chatted with other runners. We then met back up with Tom and were introduced to his friends who had just come in. They graciously drove us back to Pan Toll where our car was parked. Thank you so much!! Once we got back to the hotel, Brian vetoed his typical post-run ritual of an ice bath and substituted it with a nice, hot bath followed by very carefully taking off the tape from his severely blistered feet. It was really difficult for him to walk, so I pulled him around in his “wheelchair” – the office chair with wheels we had in the room. It was hard not to giggle while I was pulling him around in this chair, which continued the next day while he recovered. As for myself, I was a little sore from the 13 miles, mostly my shins and calves from the uphill/downhill running and uneven parts of trail. Luckily I was fortunate that my pre-existing blister did not reopen (I think taping it helped), and I didn’t get any new ones, either. We both got massages on Monday, which felt great. Definitely a nice way to end our weeklong vacation!